I teach adults and I teach kids. When adults do not do well on an exam, they generally do not make excuses. They accept the results and resolve to do better. The kids often make excuses as to why they performed poorly on a test. They plead for an open-book test or a retest so that they can change their low grade. I witness a general unwillingness to accept responsibility for their actions, even after their errors are clearly pointed out to them. Watching Philomena, a true story about a girl who makes a mistake in her youth for which she atones for the rest of her life, reminded me of the mature response to adversity of an adult, seasoned by life experience. A London journalist, Martin Sixsmith, is approached by the daughter of Philomena Lee. She asks him to write a human interest story about her mother who was compelled to give up her son Anthony almost fifty years before. Through flashbacks, we learn that Philomena had the baby out of wedlock and was sent by her father to an abbey in Ireland. There, she worked in the convent laundry for four years to work off the debt incurred by her stay at the convent. One day, without any advance notice, she discovers that her son is being given to a foreign couple for adoption. The separation is traumatic, for she is unable to say farewell to him. The secret of her lost son is kept for many years, and the convent offers no help in finding him when Philomena periodically visits her former home. Together with Martin, Philomena begins her deliberate and long-postponed search for Anthony. In the course of their investigation, they ascertain that the nuns deliberately destroyed all the adoption records, and that many of the children in their care were sold to rich Americans to subsidize the church’s work. Serendipitously, Martin finds out that Anthony moved to the United States with his adopted parents and established a celebrated career in government, serving as a legal advisor to two presidents. Philomena and Martin travel to the United States to unravel the mystery of his present condition and whereabouts, with startling results. Characteristic of Philomena in her quest to ferret out the truth of Anthony’s life, she encounters many obstacles, including a number of people who do not wish to share information about her son. Nevertheless, she politely persists in her drive to get information about him. It is this quiet tenacity in the face of adversity that is a hallmark of her being. She does not want to hurt anyone in her quest or reopen old wounds; she only wants to connect to her beloved son, who abruptly left her so many years ago. In her response to every impediment she encounters, Philomena demonstrates a mature sensibility. She does not give up; rather she works through the problem and then develops, together with Martin, a strategy for moving forward. Jewish tradition extols the aged person because age brings with it wisdom. The Ethics of the Fathers writes that after age 50, one possesses the ability to give advice to others. Life is a teacher, and advanced age brings with it the gift of being able to render wise counsel. The older person evaluates things more carefully and is less prone to respond to adversity with outbursts of anger and irrational action. 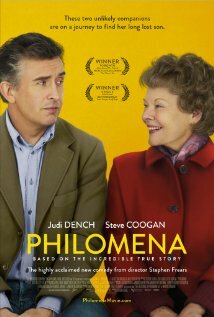 Philomena is an exemplary role model of an adult who accepts responsibility for the past, but who desires emotional closure for that past. She thinks things through and, when appropriate, is willing to change her mind when she is convinced that another approach makes more sense. In one of her interchanges with Martin, who gets angry when faced with deceit, Philomena reminds him that the best path to follow is the path of forgiveness. It is not wise to remain angry when things cannot be changed. Better to accept an imperfect word and move on with one’s life than get mired in anger and negativity. Wasn’t a big fan of this, although I liked the intentions. If ever so slightly. Good review.